Albuquerque, NM- On October 22, 2015 a Congressional whistleblower leaked 11 undercover videos recorded by The Center for Medical Progress to Gotnews.com. This bundle of over four hours of video had been blocked from public release in July after a lawsuit was filed by the National Abortion Federation. This set of videos have members of the New Mexico abortion cartel mentioned throughout. While many have done their own analysis of this chunk of video footage and everyone who views this footage picks up on different things, I want to hone in on what I observed and took away from the perspective of a pro-life missionary to New Mexico and an activist, who interned with Operation Rescue for over a year. The first set of videos I watched were titled “Fetal Disposition” and were merely a forum to bemoan the increasing legislation regarding disposal of fetal tissue after an abortion. This topic alone strikes fear into the heart of those running abortion mills as they have to figure out what to do with the bodies of their victims. Three things in particular stuck with me after this segment. The first is the mentality of Northland Family Planning abortion facility owner, Renee Chelian, she talks about her experience exploring disposal options at crematoriums, funeral homes and even comments that it would be great if “fetus'” could be used to produce energy (Fetal Disposition Part 3 at 18:55). How to dispose of aborted baby body parts is an issue for many abortionists which is why Planned Parenthood has been caught selling body parts to biotech companies for research purposes. Since disposal options in Michigan were not readily available Renee Chilean expresses her overall frustration and desperation when she states in all seriousness that they were tempted to give the dead baby body parts back to the women after their abortions in a “gift bag” to take home and figure out what to do with it. She states (Part 1 at 28:22 into Part 2), “It’s their pregnancy and why is this our problem?” So killing the pre-born child is their “problem” but that’s as far as they feel they should go because disposal legislation is making their job too difficult. The second statement that stuck with me occurred during the question and answer portion of the segment where Renee Chelian (Fetal Disposition Part 2 at 17:53) sums up the problem with America. “This country doesn’t want to deal with death and dead bodies or tissue.” I think she is right and this is why so many, even among pro-lifers, want to dismiss showing or seeing the victims of abortion and also why many politicians, especially those in New Mexico are consistently turning a blind eye to the murder of pre-born children. The third thing that was very evident during this discussion is the involvement of Universities in the procurement and use of of aborted baby body parts in research. This is a cause of great concern regarding our own University of New Mexico (UNM) which has a research arm that has most recently announced groundbreaking vaccines that may potentially use aborted fetal cells and or tissue. All of these discussions were held at National Abortion Federation (NAF) conferences and the history of NAF hits close to home here in Albuquerque as Curtis and Glenna Boyd, owners of Southwestern Women’s Options late term abortion facility, have been involved with NAF since its inception. In fact, Curtis Boyd is a founding member of NAF. Also admits that he knows he is killing children! In April of 2014 when the video titled “2nd Trimester Provider Self Care” was recorded by CMP, Glenna was introduced (Part 2 at 12:49) as Chair of the NAF Board of Directors. This particular video footage is centered around a panel of abortion industry workers, including Glenna, who had been asked to give 2nd trimester abortionists tips on self care and overcoming the stigma that haunts them. These folks do after all dismember human babies for a living, this forum proves that it takes a toll on them. In addition to the stigma they receive from killing babies, Glenna Boyd also lamented that reporters dared to report on a woman who died from an abortion complication at their Texas facility back in 1980. Several abortionists referenced the higher stigma that they receive as abortionists when a patient dies from an abortion related complication. Glenna Boyd also spoke about the emotional toll and outrage she experienced due to our tireless efforts working with Operation Rescue to document several abortion related complications at their late-term abortion facility, Southwestern Women’s Options, located in Albuquerque, New Mexico. Glenna specifically referenced an article that ran on the front page of the Albuquerque Journal after abortionist Shelley Sella, who works at Southwestern Women’s Options, ruptured the uterus of a woman during a 35 week abortion. While the speakers all shared their perceived persecution from pro-lifers, the in fighting of the pro-abortion movement was spoken about as well. Some in the abortion industry feel that Planned Parenthood doesn’t respect independent facilities and thus tries to steal their clientele. Abortionist Uta Landy also spoke on the panel titled “2nd Trimester Provider Self Care.” Landy recounted an incident by a fellow abortionist about an eyeball falling into their lap during an abortion (Second Trimester Provider Care Part 4 at 9:30). This disturbing account has gotten quite a bit of attention, since the scenario provoked an eruption of laughter and applause. The fact that this all happened during a panel designed to address and attempt to overcome the stigma surrounding abortion really highlights the mindset of individuals who are in the business of killing and how desensitized they are to it. The reason that NAF tried so hard to suppress this footage from being seen by the general public is because they don’t want the world to know that their industry really is just about, death, dead bodies and tissue. The University of New Mexico (UNM) is the heart of the abortion cartel in New Mexico. For years myself and Fr. Stephen Imbarrato have met with UNM officials all the way up to the President of the Board of Regents about UNM’s radical abortion agenda with the desire to see their free standing abortion facility closed and their abortion training to be removed. 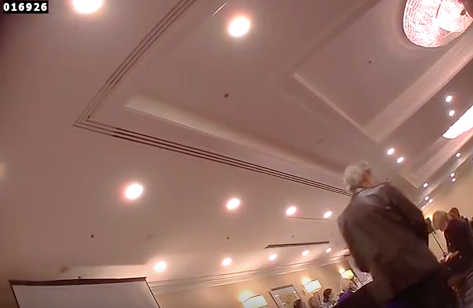 Late-term abortionist, Susan Robinson who works at Southwestern Women’s Options in Albuquerque, New Mexico, shared her position with a panel on the “Planned Parenthood Michigan Workshop Video” that is very telling (PP MI Workshop Video at 18:55). Someone previously asked Robinson, “What do you think about conscientious refusal to do abortions?” Her response, “I don’t think people should go into OBGYN if they’re going to refuse to do the most common procedures that OBGYN’s do.” This gives clear indication that Robinson and other New Mexico abortion industry workers have the mindset that there should be no choice for medical students or OBGYN’s to opt out of performing abortions. We have personally been told how the faculty staff at UNM treats students who opt out of abortion training, they are belittled and looked down upon. 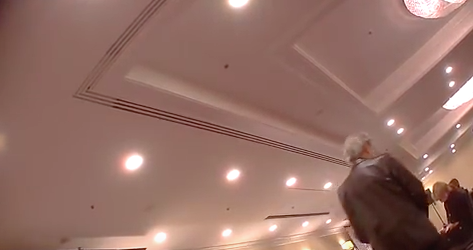 These latest videos have given us a glimpse into the heart of the abortion cartel. These people know that they’re killing babies, in fact they revel in it. They know that what we’ve been showing through abortion victim photography and when we say that, “Abortion Kills Children”…it is TRUE. Our country is at a point where we must apply the necessary pressure to stop this needless murder once and for all. How is it that abortionists can admit that they’re killing human beings in a violent manner and Roe vs. Wade still remains in effect? All the blinders need to come off and, “We the People” have the responsibility to demand an end to this atrocity. Fr. Stephen Imbarrato, with Priests for Life, who we work closely with in Albuquerque, New Mexico, has a decisive strategy to end pre-born child killing in this nation. Protests leading to a national strike, where we all refuse to go to work or spend any money, bringing the nation to a halt. This decisive strategy has the potential to END abortion outright if enough people embrace it. The pro-life movement is doing a lot of great and necessary work but all of our great efforts are merely a bandaid and will never end pre-born child killing entirely. Thanks to these leaked videos we can clearly see the mindset of the abortionists and those in the deepest levels of the abortion cartel. Now is the time to protest and to demand that this country and its leaders deal with the death and dead bodies that are piling up in our communities. For more information about National Protests visit ProtestABQ.com. Albuquerque, NM- Trifecta…this past week three major articles were published exposing all three abortion killing centers in our city. As pro-life missionaries we came here 5 years ago to make New Mexico abortion free. To have ALL three abortion clinics come under scrutiny in one week is a small victory! As Christians reflecting Christ, we must be the light shining the truth into the darkness. It is our responsibility to rise above the status quo and apply the necessary pressure and to be the salt which has the ability to preserve our communities. We can’t do this work without you! Thank you to everyone who has joined in national protests in your communities and who support our efforts through your faithful prayers and financial support. You are invaluable in this battle for human life! Please mark your calendar for two protests we are holding this week. On Wednesday, October 21st we will hold our weekly overpass protest and since the Department of Transportation tried shutting us down a few weeks ago we really need more helpers to hold banners and signs. Join us from 5-6pm at GPS and park at 6000 Brentwood Ln. NE. On Saturday, October 24th we will protest at Planned Parenthood (701 San Mateo Blvd NE.) from 10-11am. We must keep the pressure on and maintain a peaceful protest presence at this place of death. How Much Money Does it Take For New Mexico GOP Leadership to Turn A Blind Eye To Baby Body Part Harvesting? Albuquerque, NM- As congressional hearings regarding Planned Parenthood’s aborted baby part selling practices are still underway, New Mexico legislators have asked questions of their own to the University of New Mexico’s Health Sciences Center. On July 23, 2015 a meeting was held to discuss any potential illegal activity regarding the use and or sale of aborted baby body parts that may be occurring at the University of New Mexico with several New Mexico legislators and the Chancellor of the Health Sciences Center, Paul Roth M.D. This video and those that followed have opened the eyes of the nation to the reality that aborted baby parts are sold by Planned Parenthood to biotech companies for a profit, it also raised suspicion about the practices of abortion facilities in New Mexico. According to the New Mexico Campaign Finance website, just seven days after this meeting between Roth and New Mexico legislators, Roth made a $500 donation to the Don Tripp Speaker PAC. Click here for a link to the actual Expenditures and Contributions Report. Don Tripp is the first New Mexican Republican Speaker of the House in 60 years. Roth on the other hand is an avid abortion supporter and for several years in a row has tried to pass Embryonic Stem Cell Research bills at the New Mexico legislature. 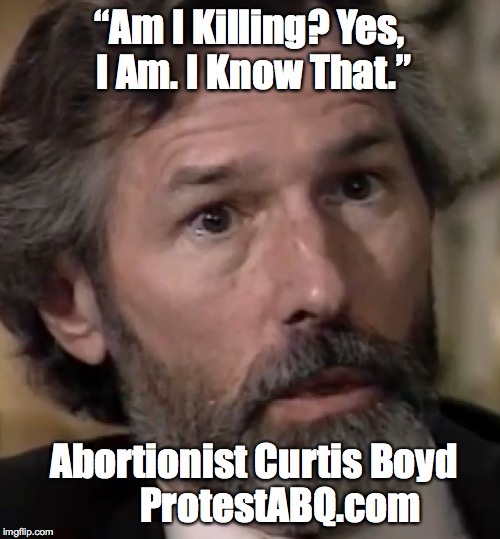 Protest ABQ would like to know why Paul Roth gave an uncharacteristic donation to the Republican Speaker of the House, could it be that he doesn’t want Republican leadership asking anymore questions about what the University of New Mexico is doing with the remains of aborted babies? New Mexico has no restrictions on abortion which has been a catalyst for it being home to the nationslargest late term abortion facility. The University of New Mexico is considered the heart of the abortion industry in the state. It runs a free standing abortion facility, and heavily promotes abortion training to it’s medical students. The recipient of the 2014 Margaret Sanger award was given to Eve Espey, an abortionist and chair of the Department of Obstetrics and Gynecology at the University of New Mexico. The University of New Mexico is also a research institution which would lend itself to the practice of using aborted baby parts for medical research.New Mexico law forbids the use of aborted babies in medical research. So if the University of New Mexico is using aborted fetal remains in their vaccines and other medical experiments they are breaking state law. “The University of New Mexico, a publicly funded institution, is entrenched in promoting abortion and an overall pro-death agenda. These questions remain: What did Paul Roth discuss in the meeting with Republican legislators? Why did Paul Roth donate to Republican leadership seven days after this closed door meeting? Speaker Don Tripp should return Mr. Roth’s $500, and if he’s being pressured or tempted to turn a blind eye to what the University of New Mexico is doing with aborted baby body parts, we encourage him to keep probing to ensure that there is not any illegal activity taking place. The state of New Mexico needs leaders who can’t be bought or silenced, our future depends on it,” stated Bud Shaver, Executive Director of Protest ABQ.